Let's face it -- beauty masks definitely ruled 2016. From sheet masks to clay masks (and everything else inbetween), everyone from Chrissy Teigen to Miranda Lambert shared a snap of getting their mask on last year. And with so many products on the market, it can be hard to pick out a product that does it all -- without spending a fortune. 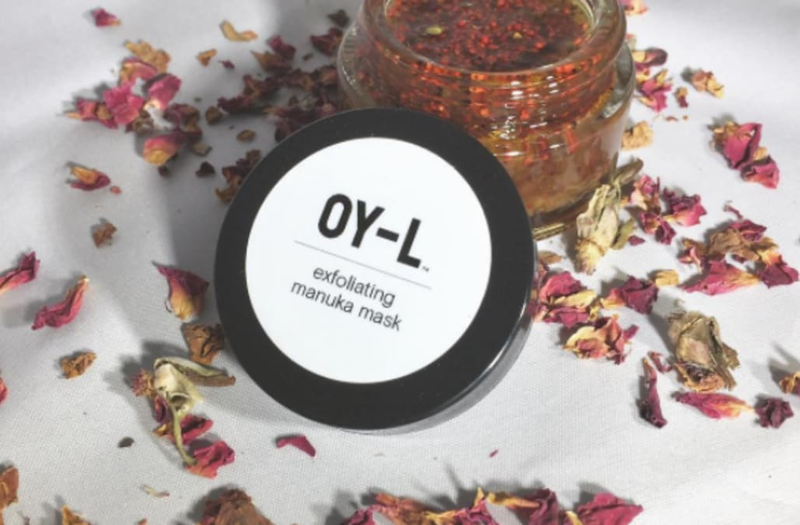 Let us introduce our newest obsession, the exfoliating manuka mask from indie brand, OY-L.
always feeling rosy after using our exfoliating manuka mask 🌹 part of what makes this mask so special is the ground up rose petals that refresh your skin naturally! "Dreaming of winter break with @oylnatural's Hydrating Facial mist from their Bon Voyage Kit! Like everything from this clean, modern, + utterly unique brand, the ingredients are the focus - from rose hydrosol to Abyssinian oil and radish root ferment filtrate!" 💚 Thank you, Amy @beautystealsinward for the kind words and stunning photo! While sheet and clay masks (and who could forget multi-masking?) had a moment in 2016, we believe honey will have an even bigger spotlight in 2017. The high-viscosity exfoliator leaves your face refreshed and most importantly, hydrated, without scrubbing your skin's natural oils away. Made with manuka honey, the ingredient is known to naturally treat infections and protect against damage caused by bacteria. After using it for two weeks (3x a week) we noticed skin was brighter and our acne scars were slightly less visible. While it can be a little hard to slather all over your face, the formula blends together agents such as hemp seed oil, cranberry seeds and willow bark extract, to give you a radiant glow. Oy-L's founder, Andrea Pierce-Naymon, created the skincare line after her daughter became ill with Postural Orthostatic Tachycardia Syndrome (OY-L donates 15% of sales of the bath salts and body scrub to Dysautonomia International). After applying to your face in a circular motion, leave for 20 minutes and rinse with cool water (your pores will thank us). After drying your face, their face cream (if you want that *DEWY* look or have extremely dry skin) and their hydrating facial mist (perfect for layering under makeup), are also among our favorites. Whether it's your end-of-the-week beauty ritual or your favorite way to jump start your week, this mask will give you a ~radiant~ glowing start to the new year. Should you get a smart mirror?